Located less than 5mn by feet of the Sacré-Coeur, the Moulin-Rouge and famous Garnier Opera, in a residential street, and in the heart of a bubbling commercial zone, the hotel Corona Rodier will be able to charm you by his simplicity and its comfort. The district of the hotel abounds in theatres and entertainments in any kind (stores, monuments...), and it is ideally located at the crossroads of the principal Parisian stations. 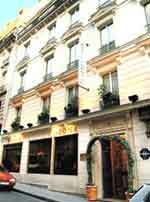 Indeed, the hotel is located near the Gare du Nord and gare de l'Est, ideal for the travellers of business taking Eurostar, or even arriving at the airports of Charles of Gaulle or of Orly . Businessmen will be able to appreciate the Wifi access, the safe, and will be able to also slacken with satellite television giving access to the international channels in all rooms, and thanks to the capable personnel, professional, relaxed and cordial of the hotel.